For four weeks from mid-February to mid-March my 13 and 15-year-old daughters were in a paper-trading stock competition with ten of their girlfriends set up by one of the mothers. My 15yo Alex won with 14 trades and a 28% return on an initial $10,000 in investable capital, most of those gains from just one trade. It was interesting to see what some of the girls did in the trading portfolios… there were lots of buy and holds of AAPL, LULU, SNAP, AMZN, SPOT, ULTA, etc… using the ol Peter Lynch style of investing, but these girls while investing in what might be risky names were playing it safe actually. The returns for the game would be not be annualized for the month, so it was an absolute return game, and to win it would take some gambling, risking the $50 entrance fee to possibly make $500. So Alex who is very competitive and likes to win most things that she engages in keyed in on the main point of my email and asked me to start looking at the earnings calendar with her and daily we discussed companies set to report. The first thing we looked at was how the stock had been performing on an absolute basis, rallied from its recent lows, how far from its 52-week highs. Then we would consider analyst sentiment, short interest, and then discuss expectations. These inputs were, and probably remain fairly foreign to Alex, but the main reason our friend set the game up was to get our kids familiar with the stock market and start conversations like this, with the hope that it sparks greater interest among the kids. After some deliberation, looking at charts we basically we were looking for stocks that had the potential to meaningfully outperform expectations. With just a few days left to the March 15th deadline, Alex was up a few percent and sadly in 5th place, the earnings trading strategy had basically been a wash, she had a couple of big winners, a couple of big losers and a lot of nothing in between. But then we took a closer look at MongoDB, ticker MDB, a cloud-based open-source enterprise software company scheduled to report its fiscal Q1 earnings on March 13th, trading up 2% on the year, and very near its all-time highs made in February. And like that, the company issued a beat (a smaller than expected loss, and a greater than expected sales gain) and the stock was trading at new highs on the opening, up a whopping 23%! The moral of this story is NOT to turn your investment/trading program into a casino. She got very lucky, she did have one stock (ELF) that was down 21% the prior week… Regular readers know that we often give the following disclaimer when detailing long premium directional options trades into events like earnings; ” you need to get a lot of things right to merely break-even, direction first and foremost, but also the magnitude of the move and timing”. Now trading stocks into earnings is a little less fraught with those constraints, but also had more risk to the downside. This for a company that had a GAAP net income loss of $99 million on $253 million in sales in FY 2019 just ended and $101 million loss on an expected $370 million. While the loss stays fairly similar, sales are expected to grow by more than 40%. 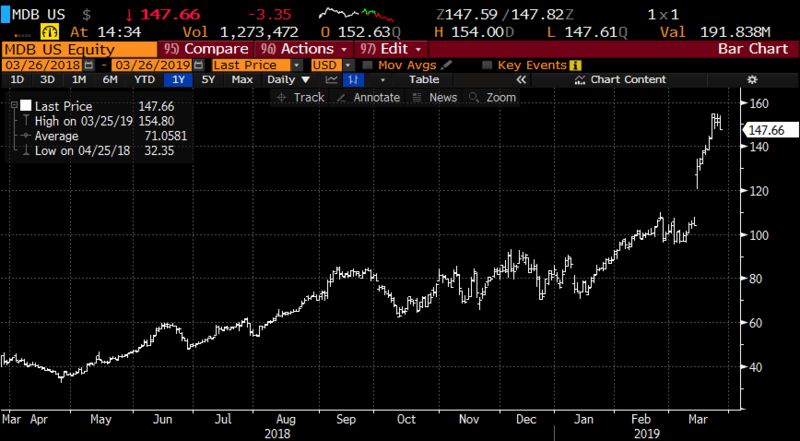 This stock trades at the astronomical sum of 21x sales, there is NO buyer for a money-losing company at this multiple. Since the earnings gap, short-dated options prices have come in hard, with 30-day at the money implied volatility at 50%, implying daily moves of low single digits %. With the stock just below $150, the May 150 straddle (the call premium + the put premium) is offered at about $23, if you bought that, and thus the implied movement between now and May expiration, a little less than 2 months, you would need about a 15% move in either direction to make money on May expiration. Rationale: this trade idea looks to take advantage of selling 2 out of the money puts near the target price to help offset the decay of the near the money put that this trade is long. risking 4 to possibly make 16 if the stock is back towards the recent breakout in a little less than 2 months.